I don’t understand the attraction of cameras in mobile phones. They take lousy pictures. I have yet to use a mobile phone that takes a decent picture. Maybe its me and my hand just isn’t steady enough. This morning as I was coming into the office I found this little guy sitting in the driveway. Unfortunately the picture isn’t very good because I took it with a camera phone! 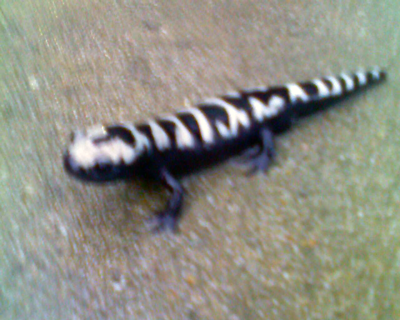 It has been raining for the last day or so but I was still a bit surprised to see a salamander in the parking lot. I am not sure what kind it is but I thought it was pretty cool looking so I took a picture of it. After I took his picture I picked him and put him in one of the gardens so he wouldn’t get mushed by a car.